WordPress forms plugins create contact forms, such as WPEverest Forms – the one key marketing tool that gleans information needed to move prospects to buyers. This forms plugin enables you to get contact details so that you can market to (and sell to) potential buyers. WPEverest Forms gives you the leg up – making you a more effective marketer, so you can sell more, service better and make more profits. From security to reachability and clarification to convenience, there are numerous reasons to include a contact form on your website. If your WordPress hosted sites aren’t using a WordPress contact form today, then you are missing out on the most critical pillar of success for any site – engagement. Whether you own an eCommerce store, a blog or a business platform, contact forms assist you in growing a two-way communication between you and your clients. Knowing the importance of a contact form on your site, the question now becomes, which WordPress forms plugin and contact form best suits your needs? While there are plenty of WordPress forms plugins out there, our focus today will be on WPEverest Forms. 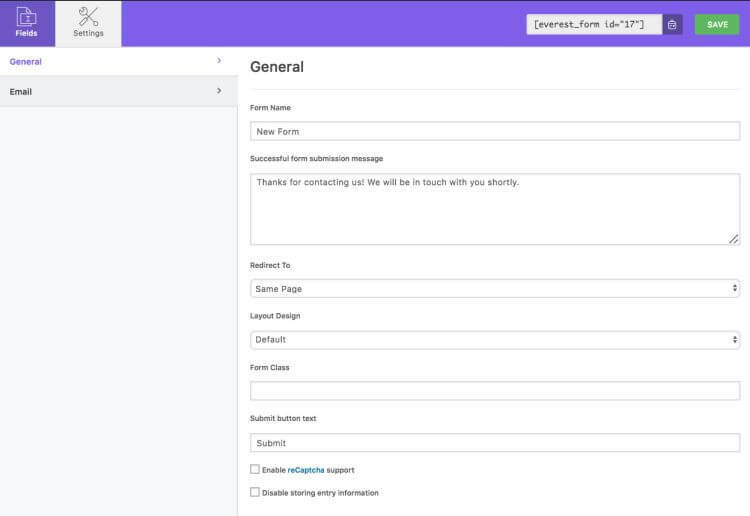 WPEverest Forms is an easy-to-use, drag-and-drop builder plugin that lets you create contact forms fast. Its interactive form builder enables you to arrange the form and key in fields with ease. What’s best is that this form has incredible features designed to enhance your and your users’ experience, including mobile responsiveness, multiple column support, unlimited forms, form templates, drag and drop fields, shortcodes etc. It’s also supported by Google ReCaptcha – an indispensable spam-reduction feature meant to keep bots from flooding your inbox. You can even create multiple choice drop down or checkboxes if your form requires it. WPEverest Forms also supports multiple email recipients, which effortlessly allows multiple users to receive email notifications. With this forms plugin you can further adjust the email settings to suit your preferences and needs. Once saved, you can add the form anywhere in a post or a page simply by copying and pasting the shortcode. Do you like the sound of that? Well, there is more. In this age and time when people use different devices to browse the net, the importance of having a mobile responsive contact form can never be overemphasized. The creators of WPEverest Forms know this fact too well, which is why they came up with a form that’s not only simple and clean but also 100% responsive. Since the form is designed to fit any size of the screen, users can access it on their mobile devices, tablets, laptops, desktops or any other devices they are using. ReCAPTCHA is easy on humans and hard on bots. It protects your site from abuse and spam, thanks to its advanced risk analysis engine and adaptive challenges, but allows valid users to pass through with ease. By installing WPEverest Forms on your site, you get to enjoy the state of the art abuse and spam protection for your website as well as simple interaction for your users, for free. ReCAPTCHA is designed for security and is always abreast on abuse and spam fighting trends to keep its users safe. And with WPEverest Forms by your site, you won’t have to worry about how to deal with endless spams anymore – especially not from bots. The drag and drop technology has revolutionized the way people do their online operations. Many web users have been attesting to the convenience that this type of virtual technique brings. Since the drag and drop technology involves dragging an element from one location to another, you get instant visibility of your actions and their results. Additionally, it doesn’t need you to have knowledge about codes, which is a good thing because then, you can perform actions irrespective of your experience level. Expert Forms feature these drag and drop fields – and lets you customize all components of your form without the need to write a single line of code. Otherwise, it would take you days or even weeks to write, especially if you can’t code very well. Our list of five cool things about WPEverest WordPress forms plugin wouldn’t be complete without us mentioning the fact that the plugin is translation ready. This is very thoughtful of WordPress, considering there are hundreds of languages across the globe. It would be unfair if the forms could only support one or two languages. But since the plugin is fully translation ready, you can go right ahead and translate it to your preferred language – whether it’s English, Spanish, Indian, Chinese, Swahili and so on. Think about the edge that this will give your business. Variety is the spice of life – and contact forms too. WPEverest Forms allows you to create as many form fields as you wish and places no restriction to the number of forms. It also lets you view all entries and forms easily through the dashboard. You can even export the entries as CSV files. And the best part is, with the drag and drop feature, user-friendly interface and other user-oriented integrations, it is much easier to customize your form’s settings. There you have it; the five cool things about WPEverest Forms WordPress plugin. If that’s not enough, the pro-add-ons have more to offer. For a small additional fee, you can add useful features like ConvertKit, MailChimp, PDF Form Submission, PayPal Standard, Geolocation, Conditional Logic, and Multi-Part Forms. Now is a great time to improve engagement with your audience, enhance your lead capture and convert more traffic from suspects into prospects (and ultimately paying customers).